The airport is situated between the villages of Corvera, Los Martínez del Puerto and Valladolises within the municipality of Murcia. The new IATA designation will be RMU, and also by the ICAO rules will be known as LEMI. 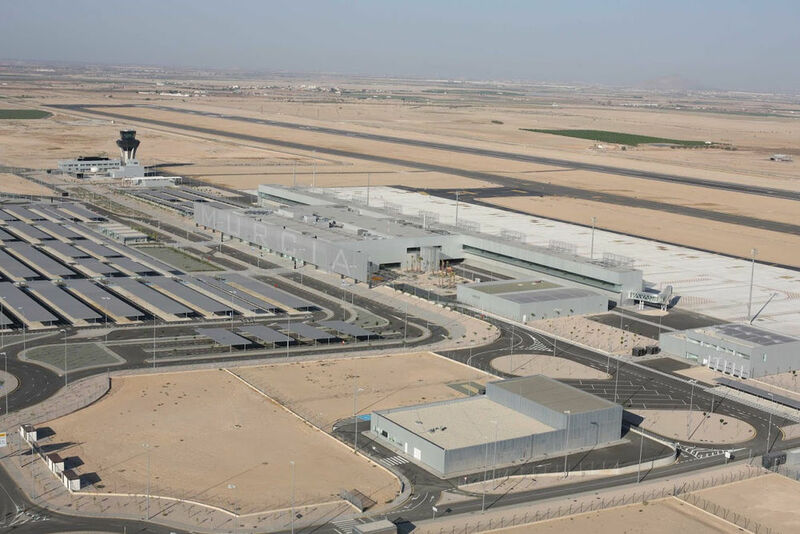 The development of the airport was proposed as Murcia–San Javier (MJV) had insufficient capacity for civil aviation due it also being a military base. In November 2017, the Spanish government awarded AENA the contract of managing the airport, with San Javier Airport closed for civilian flights. The airport has a single passenger terminal of 28,500 m² and a single 3000×45 m runway denominated 05-23. The aircraft parking platform has an area of ​​74,000m² with various positions for the aircraft type. The terminal is equipped with 9 boarding gates, 25 check-in desks and 4 baggage reclaim belts. Initially, it will have a capacity of 3 million passengers, but it will be subsequently increased to 5 million passengers. The runway has one rapid-exit taxiway (RET) and 4 holding bays. It is equipped with precision approach instrument ILS CAT I at threshold 23 and non-precision instrument DVOR/DME. The air traffic control service is provided by Ferronats, a company owned by Ferrovial and NATS (a British provider of air navigation services) that provides tower control services in another nine Spanish airports. The first inbound flight to land at the new airport was piloted by the flight crew from the region of Murcia. The flight was operated by Ryanair (FR1824), from East Midlands (EMA), one of the 16 routes which the airport will operate. Not long afterwards, the King of Spain Felipe VI landed and officially declared the new airport open.